The two-day conference features lectures, tours of Cather-related sites, as well as a performance by pianist Virginia Eskin, who will also speak about the way Cather used music in her fiction. “I have long believed New Hampshire is a social place for artists, painters, sculptors, musicians and writers,” speaker Virginia Eskin said on Friday at the Jaffrey Meetinghouse. Eskin, a classical pianist who has been honored by a Lifetime Achievement Award from the Lotus Club of New York, spoke about author Willa Cather, composer Amy Beach and composer Edward MacDowell, who each have a connection to the area. Cather came to Jaffrey in 1917, staying at the Shattuck Inn, in an effort to find a place of seclusion for her writing. “There’s something great about the experience [of living in Jaffrey] and I’m not talking about black flies,” Eskin said. Eskin moved to New Hampshire in the 1980s and owns a cottage on Gilmore Pond. Eskin also spoke of Edward MacDowell, the namesake of Peterborough’s MacDowell Colony. Eskin deviated from the norm of other Amos Fortune Forums when she took a seat behind the in-house piano to play a number of interludes throughout her talk, some of which were from rarely heard compositions. The Reading Civic Concert Band celebrated Black History Month with a program featuring black composers who wrote in a variety of idioms, frequently with references to their African heritage. 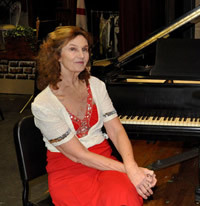 The band was assisted in this endeavor by Virginia Eskin. A celebrated pianist who has performed with major orchestras around the globe, Bostonian Eskin is also well-known as a student of ragtime. Her father was a sideman with the famed Paul Whiteman Orchestra, and she naturally grew up playing jazz around the house. A good enough cellist to play professionally, she decided to concentrate on piano and attended the Royal Academy of Music in London. 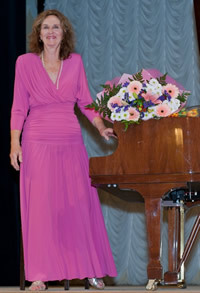 American pianist and musical emissary Virginia Eskin performed in St. Petersburg. 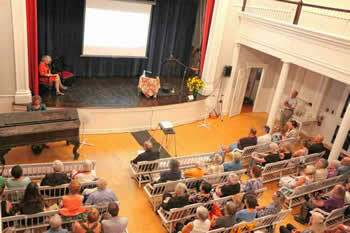 Possessing extraordinary virtuosity and limitless energy, Virginina Eskin charmed a sophisticated Petersburg public. The concert, which took place in an ancient elegant hall on Little Stables, transported the audience into salons in 19th Century Philadelphia, Atlanta, or Boston. Viriginia would have naturally blended into the company of pleasant American ladies, who volunteered to help their fighting husbands or brothers and enjoyed beautiful works by European composers. Viginia Eskin is an absolute master of her craft. She has excellent technique and divine sound; but there is also something subtle in her style and in her stage presence that is reminiscent of the fresh playfulness of youth. Eskin's performances have vivacity, panache and soul. Then Virginia Eskin stole the hearts of her listeners in Gershwin’s “Rhapsody In Blue” on the beautiful Steinway. The audience stood to give a well-deserved standing ovation to both her and Maestro Wada. ...Further rhythmical effects, and hte influence of classical music, were explored in works by Louis Moreau Gottshalk, Nathaniel Dett and William Albright, brilliantly interpreted by Eskin. 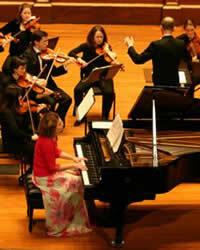 Virginia Eskin performs with the Chamber Orchestra of Boston during Friday's ''Ferocious Beauty'' concert. But its greatest asset was pianist Virginia Eskin, an adventurous musician and tireless champion of women composers. This was the East Coast premiere of the piece, and it is eminently worth hearing again. Eskin's playing was a marvel of poise and balance, and the long, rippling melodies in the slow movement were transfixing. Eskin returned for the concert's finale, Liszt's early, rarely performed "Malédiction" for piano and strings. In addition to the expected virtuoso pyrotechnics, there are some unexpectedly daring harmonies, as well as traces of the mature composer's ability to transfigure a musical idea into its opposite. Still, its most notable aspect is the flashy solo part, one that Eskin handled with surprising ease. "You're not supposed to like Liszt," the pianist chided as she returned for an encore - a reference, most likely, to his status as the concert's token male. The encore was a thoroughly enjoyable rag called "Pickles and Peppers," written in 1906 by American composer Adaline Shepherd. English translation: "Both of them deserve the highest praise for their performance in which impeccable technical skill is married to deeply sensitive and insightful imagination." "This comes as a very valuable addition to the select Kaprálová discography. ... "The performances of this too-little known music are terrifically engaging." "Each piece is remarkably expressive (of course it helps that the performers here are so wonderfully expressive as well) with equal amounts of moribund and ponderous music balanced by spunky and fiery compositions." "Riveting performances by Virginia Eskin and Stephanie Chase"
"Eskin took charge - literally- her flamboyant approach, suited the variations....the lady can make a piano speak, sing and thunder"
"Eskin is formidable at the keyboard. One is reminded of Gina Bachauer (her teacher apparently) who "played like a man" Aside from her obvious keyboard gifts, Eskin also demonstrated superb poise as a gifted interlocutor. It was she who offered the concluding keynote, observing that the music of women composers is not main stream..........."but we're getting there!" she asserted. "Conductor Francis Wada was joined by a musical presence, pianist Virginia Eskin, statuesque and resplendent in a flowered skirt and given to grand arm gestures that accentuate the drama of her virtuosic forays. She has the technique of a Kissin or Richter, able to spin out runs and chords at mind-boggling warp speed. But it is the conclusion of a dazzling cadenza, that brings audiences screaming out of their seats." As with the Stravinsky, the Virgil Thomson score Morris chose is played onstage -- by Virginia Eskin, who not only made the complex music legible but looked as elegant and svelte as the dozen dancers in their Santo Loquasto costumes. I like Amy Beach. Her Gaelic Symphony is a delight, and I'd love to see some enterprising company (Naxos, maybe?) 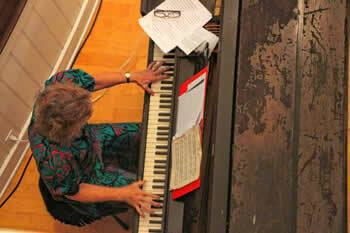 give pianist Virginia Eskin a shot at recording her piano concert. 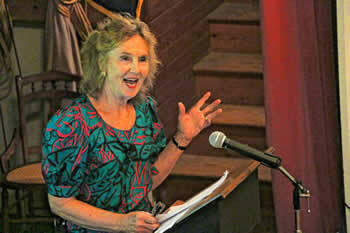 She has championed the work for years, after all. Eskin seemed the driving force behind the performances. 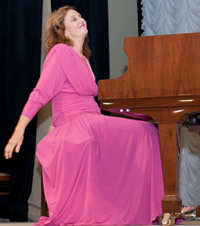 Always a powerhouse at the keyboard, she took full advantage of the virtuoso opportunities in Liszt's solo showpiece. It was amazing how much volume she could get out of the church's baby grand, especially in the fire and thunder of the rhapsody's ending. The formidable Boston-based pianist Virginia Eskin, in a blazing, impetuous reading of a harsh and chilling work, succeeded in recreating a musical vision of an artist's life under brutally inhumane conditions. ...an irresistible CD by pianist Virginia Eskin ... Eskin captures all the insouciant charm of the country's first great popular music, and firmly observes Joplin's admonition that it is never right to play ragtime fast. Just well. Eskin's playing was a reminder that being a virtuoso involves more than nailing all the right notes. It involves having musical courage. And if you have personal courage to back it up, as Eskin does, so much the better. Boston-based Virginia Eskin, our foremost proponent of turn-of-the-century American music for the piano, served as soloist in the concerto. As the work's foremost exponent, Virginia Eskin has brought Mrs. Beach's handiwork to the orchestras of Buffalo, N.Y., Rochester, N.Y., San Francisco and Utah among others. It is no wonder she continues to be in demand. She owns the piece, from the Schumannesque reveries of the first movement to the knuckle-busting final Allegro. Usually, it's the orchestra that collaborates with the pianist, but Ms. Eskin returns the favor, seeking out instrumental soloists - a cello here, a clarinet there - and accompanying them with chamber-like intimacy. When you love and respect the music, you serve it as best you can. To this Eskin brought strength, sensitivity and passion, balancing the brilliance of things like the first-movement cadenza against the lilting sparkle of the Scherzo, here taken at an exhilarating clip. ...the series of chords before the coda in the Chopin Ballade was pedaled in a most unusual and compelling way. But the pleasure of Eskin's playing usually lies less in illumination of detail than in its elan and its inexorable momentum; nothing slows her down. Paradoxically, the harder the music, the better Eskin plays - perhaps the best thing on the program was Ravel's "Scarbo," which the composer set out to make the most difficult piece in the repertory. This was superb pianism - and an enthralling bit of storytelling. ...Eskin always goes for broke, and that's why she's not just a pianist but a communicator. Wow! Eskin's own experience of the works she was playing was one of liberation. Pianist Virginia Eskin (who was born in San Diego but has for many years resided in Boston) gave what can only be described as a sensational recital at the Athenaeum. Eskin's style, whenever the piece makes such an approach appropriate, is stupendously energetic and impetuous, almost wild. She plunges into the music without reserve, intensifying contrasts, underlining climaxes, taking immense risks, holding nothing back. ... --this is Eskin's meat, and she chews it up with a zest that is overwhelming and irresistible. ...And with all this, and the most exciting of all, there was the sense that, for all her magisterial control of a variety of musical styles and compositional personalities, Eskin's own experience of the works she was playing was one of liberation, a spontaneous self-renewal in confrontation with music that she was encountering for the first time. Eskin believes it is desperately important for these compositions to be heard, not only in their historic matrix but as artworks of merit. She pleaded with the assembled student audience to study and play them. "It is incumbent on us all to look for other, odder, wilder music than that in the canon. It can teach you a lot." In a short variation movement of Viktor Ullman, written in the camp, Eskin showed how a sweet folkloric ditty is transformed into something brutal and cataclysmic, only to end quietly high in the soprano register. She called it "triumphant music of the soul." ...Usually, it's the orchestra that collaborates with the pianist, but Ms. Eskin returns the favor, seeking out instrumental soloists -- a cello here, a clarinet there -- and accompanying them with chamber-like intimacy. When you love and respect the music, you serve it as best you can.